Hi there, I am a Tunisian citizen living in France and I am a bone marrow donor. (My bone marrow is in the registry in Frane). If I am a match for Matthew, I would be very happy to help! Dear Mateo/parents…I am the mother of a beautiful 23 year old daughter, who was stricken with Leukemia over 3 years ago and was in need of a lifesaving stem cell transplant. She is going to be celebrating year #4 post transplant this October thanks to an unrelated doner that was found in the worldwide registry….. I do believe in miracles….Your precious boy will find his match…My thoughts and prayers are with you all…I understand how difficult this wait is. Hello Maeo, hello parents, i would like to help you ! I’m linving in Belgium, you can contact me on my adress mail ludoprel@yahoo.fr Thank you. bonjour je souhaiterai savoir comment faire pour savoir si je suis compatible et si oui comment faire pour effectuer cette greffe. vous pouvez me joindre par mail ou par téléphone. De tout mon cpoeur je vous souhaite de sauver votre ange. I am a member of Be The Match and pray that I will be able to help someone some day. Stay stong little man! Many thoughts and prayers for you and your family. Hi Mateo. It really bothers me to see such innocence struggling with any problems such as yours. I would like to help you and become a donor. I am praying Allmight Good to give satisfaction of the requirement of Mateo!! I live in louisana and I would like to find out how to become a donor for Mathew? Dear baby Mathew, we were told 1 Jan 2013 ,my son also has Leukemia> we were told 3 weeks ago he is in full remission and his intence chemo plan has come to a end…. he knows how you feel with all the needles and chemo! The Doctors will take care of you and i pray the Angels surround you an protect you while mom and dad are looking for a doner for you! hang in there little man – Angus just turned 17 on friday and he knows how you are feeling…. he like you also always smiled… you are special kids and everything will work out. I am a healthy girl from Iran with O- blood group. I really like that you, dear small Mateo, find a donor soon and I also will register and do the blood test to hopefully be a help for you or any other else. can count on me at any time. may Jesus Christ ‘s love be always on your life,amen. I am sending you my prayer little angel. I know God is watching over you and your family and if I can help I will be happy to. I have been tested a few years ago and the way I understand it the results are on the be a doner list. You can reach me by email at cyj62@yahoo.com. How can I donate? I live in Northern Ireland I would like to try and help. I am a healthy woman with O+, & CMV Negative Blood-type. I am also on the donor registry since 2 years ago. I will be PRAYING for you and your family Mateo! I sincerely hope I will be a match for your bone marrow! I’ve sent you a couple of emails, but please reach me ANYTIME at stephaniegator@bellsouth.net. God Bless you all!!!! Bonjour i Am french Sorry i not good speak english ! I write french ok ? Je disais que suis de tout cœur avec vous et si besoin de comptabilité suis A+ du groupe sanguin . Et bon courage aux parents qui vont subir des jours très durs … On pense à vous. This has inspired me to get a blood test done and start donating. For matthew and all others who don’t deserve the cards they have been dealt. I can’t believe I’ve waited this long to start donating. Cancer is evil and it makes me so angry. Its time I actively join the fight. I will pray every night for Matthew. Better late then never, good for you. Hello Mateo and familia, my name is Valerie and I want to help! I am from the USA and am registered with Be The Match (a website that helps find bone marrow matches). Please let me know what all I can do to help! My email is valerie.a.mccoy@gmail.com if you need to contact me! Vous pouvez vous rapprocher de l’EFS (Etablissement Français du Sang) le plus proche de chez vous, je pense qu’ils pourront vous orienter. 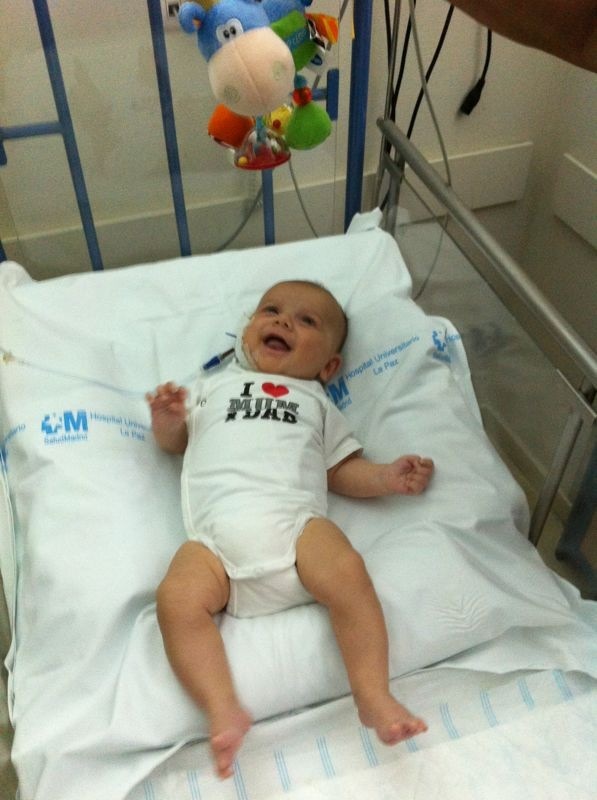 Hey Mateo, much luck to you, be strong buddy. I am a Cameroonian (in Africa, I think you know) anyway I would have liked to give mine as it can help you. But I do not know if it’s possible here at, if it is said to mom and dad for giving me the address of the center and the procedure. Still a lot of courage. Thanks to you all. I got the info I needed and will be calling. Cassie so Thanks but I have like 300 responses in 24 hour. God bless you and especially Mateo. seems like there is no Asian countries listed on the donor’s list … how do we go about? What a sweet little angel with a beautifull angelic smile. The angels are apon you little Mathew… have no fear little one as God our saviour and also yours and is looking over you and will lift away your suffering and pain and heal your little body. Through our Lord Jesus Christ and our Mother the Virgin Mary. Amen ! of donors from the USA ? Hi Matthew.. Im actually goin to register after i post this message to you. I am a mother of a 2 years old and a 4 month baby. I am very very sad that you have to go thru this at the ur early age. I hope that i will be a match for you or to anyone that needs my marrow..
for you parents keep praying and in time we will find a match for ur sweet little matthew. godbless and please keep us updated . Je suis francaise et je souhaite de tout coeur que votre petit garçon trouve un donneur compatible très rapidement. Pour ce faire, j’aimerai vous apporter mon soutien en me proposant d’être donneur pour votre petit garçon. J’habite Strasbourg et je n’ai pas trouvé de centre proche de chez moi figurant dans votre liste. my co worker and myself were so inspired by your story that we signed up to be donors and are waiting for our kits. My heart breaks for your family and I know there will be a donor out there for you. How can I help? Can I be a donor if I just had a baby 6 months ago and am breastfeeding? I lieve in Italy. Where should I go? Hi Mat, I lost my baby boy last year, he is 1 day old when god called him. Since then, I wouldn’t want other parents to feel the pain I felt. I want to help and I am hoping to be a match. However I’m from the Philippines so I don’t know where do I go. Please let me know other ways. Thanks. God bless you and your family. By the way, I am a member of Grieving Fathers in Facebook, I’ll post your website there. My thoughts are with you and the family. I live in Australia and was diagnosed with Leukaemia 18 years ago. After years of treatment I am grateful to be here and will happily spread the message about how important it is to be tested to be a Bone Marrow Donor. I have many friends who have been saved by Bone Marrow Transplants and I want as many people to know how important it is to join the registry – you can save someone’s life and give someone time with their family, time with friends, it is truly a life saving gift. I will tell as many people as I can to sign up… thinking of you. je vous invite à vous rapprocher très rapidement du Professeur Jean Hugues Dalle à l’Hôpital Robert Debré de Paris. Il existe une nouvelle technique et notre enfant en à bénéficier. Sa leucémie avait aussi été détecté à la même période que votre enfant. Can WE know what s Mateo ‘ HLA type please ! How can I become a donor if I don’t live in Canada or USA? I live in Italy at the moment. I don’t speak the language and have no idea where to go .I am going to Switzerland in a month for 2 weeks. Where should I go for my blood tests? Soy espanola, pero vivo en EEUU. Soy madre de un bebe de seis meses y un nino de dos anios. Como madre, puedo ponerme en vuestra piel. He intentado registrarme como donante, pero no se me permite por haber tenido una cesarea hace menos de 12 meses. Mi marido se va a registrar. Estare pendiente de las noticias sobre vuestro hijo. He difundido la informacion entre todos mis conocidos. Deseo con todo mi corazon que encontreis ese donante. J’ai 63 ans donc age dépassé pou un donneur ..
En étant sincèrement désolé . Je vous et lui souhaite de tout mon coeur de trouver rapidement un ou une donneuse de greffe salvatrice . Bonne chance et … Merci pour votre petit bout .. I would like to help. You can have my marrow if it’s a match. K400dzl@yahoo.com is where you can reach me. Just registered to go and give blood and register as a bone marrow donor at the same time. As a father of 2 little girls I was truly touched by Mateo’s story and hope you can find a compatible donor as soon as possible. All the best to you and your family Mateo, I hope you can soon play with your friends and brother like any little boy should be able to! Hi I will pray for Mateo, is your organisation’s global system linked to the Sunflower Foundation in South Africa or our blood banks, if South Africans donate blood samples there will they be tested for Mateo? Hello Mateo and family, I am a 45 year old mother of two from Cambridgeshire, England. I will ring our doctors surgery this afternoon to arrange a blood test. I will share this on my Facebook page and hope some of my friends will do the same. I do believe you are going to make a huge difference to many people. As a mum of a 3 yr old and 1 yr old my heart aches for you little Mateo and your family. Just joined http://www.bethematch.org and waiting for my kit to arrive. I hope someone somewhere is a match including myself. Will keep you in my thoughts and prayers. Muchas gracias Mateo!! Con lo pequeñín que eres, y a cuantos niños y niñas en todo el mundo estás ayudando!! Eres un ejemplo para tantos y tantos. Dales muchos besos a tus papás,porque aunque ahora se están preocupando mucho, no van a tardar en llevarse una alegría tremenda. Y a tu hermanito también, que nos ha mostrado a todos que fácil es poder ayudarte a ti y a otros muchos niñ@s en todo el mundo. Muchos besos campeón, y otra vez…gracias! !